Premiering: Sunday, Aug. 16th at 7 p.m. (central) on HBO with back-to-back-hours. Continuing at the same times on Aug. 23rd and 30th. Only David Simon would dare to attempt -- let alone pull off -- a six-hour scripted miniseries on the racially polarized walkup to a 200-unit low income housing project. His landing spot again is HBO, which has presented Simon’s The Wire, The Corner and most recently, Treme. All were critically acclaimed inner city dramas with smallish viewing audiences. Show Me a Hero, premiering on Sunday, August 17th and continuing on the following two Sundays, likely will end up being the same story. Favorable critical reviews, low audience turnout. It seems like a lot to ask during the waning days of another long, hot summer. Settle in for two hours on three Sunday nights for the true story of how a federally ordered mandate to nominally integrate a white Yonkers, NY neighborhood set off a powder keg of resentments and racism cloaked with the protection of property values. 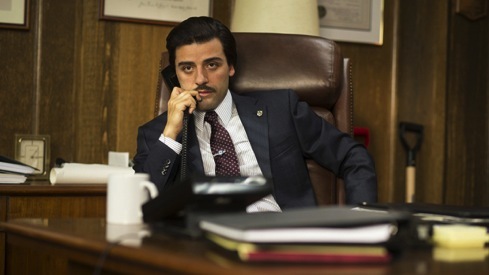 Caught in the middle was former cop turned city councilman Nick Wasicsko (Oscar Isaac), who in 1988 unseated six-term incumbent Angelo Martinelli (Jim Belushi) to become the youngest mayor in America at age 28. Wasicsko was strictly an opportunist at first, running on a campaign to appeal the federal court order before those hopes were almost immediately dashed. He then got caught in the middle, presiding over a series of stormy City Council meetings in which his backing of the court order to avert heavy fines for non-compliance made him both a traitor and an easy political target. That sounds preachy on the face of it. But Show Me a Hero doesn’t play like a political tract. Its central character, played brilliantly by Isaac, at heart is a politician on the make who ends up on the side of the angels through no fault of his own. Enlightened, disillusioned and in love with both City Hall staffer Nay Noe (Carla Quevedo) and the music of Bruce Springsteen (which resonates throughout), Nick Wasicsko sees bigger and better things for himself more than for his constituents. His epiphanies are partly born of pragmatism. And make no mistake. He wants credit where it’s due, with the prime beneficiary being the guy he sees in the mirror. Any heroes in this drama are not to be found among the politicians. Wasicsko’s arch rival, councilman Henry J. Spallone (Alfred Molina), is a grandstanding staunch opponent of the housing project. The ring-wise Martinelli, surprisingly well-played by Belushi, is more than a martinet but less than principled. And Wasicsko’s longtime ally and friend, City Council president Vinni Restiano (fine work by Winona Ryder), is fated to clash with him over -- what else -- a power struggle. Add a subsequent Yonkers mayor who claims to be a liberal. But subtract two consonants and a vowel to see him for what he really is -- a liar. Heroes are more a product of simple fortitude on the part of two minority women struggling to just get by. Norma O’Neal (LaTanya Richardson-Jackson) is a home health aid tending to white people until she finds herself legally blind at age 47. She’d rather live with her “own kind” than relocate to a white neighborhood as part of a social experiment. Alma Febles (Ifenesh Hadera) is a single mother of three whose volatile ex-husband remains in Mexico. She very much wants to live a more secure life in better surroundings. Valor also can be found in the aforementioned Mary Dorman, whose transformation is predictable but still believable and heartening. Show Me a Hero hides its agenda in plain sight. It could stand to pick up the pace at times. But this journey to the promised land for some and tragedy for others is by and large expertly crafted and intrinsically important. David Simon keeps tilting at windmills because it’s what makes him tick. HBO, to its credit, again has made room for him while others turn a deaf ear. It’s easier that way in times when our national debate has been consumed of late with Donald Trump vs. Fox News Channel’s Megyn Kelly. In the end, Show Me a Hero is not about shining a light on the dark side of “whitey.” It instead raises the question of whether our better selves can still rise above imperfect self-interest. This isn’t a sanctimonious tract. It’s another of Simon’s efforts to shake, rattle and reel us in with very human stories set against very large issues. From this perspective, I’m glad he still gives a damn.